There are certain things in your job that can lead to fatigue, discomfort, or pain when you do them repeatedly or without breaks. Working in positions such as bending, kneeling, stooping, twisting, and overhead reaching. In addition, stressful work situations can increase muscle tension and reduce awareness of proper work technique. Bending your wrist when using a hand tool may cause hand fatigue. Over time, you could develop numbness or pain in your hand and fingers. Keep your wrist straight by using an angled tool or repositioning the material. When your wrist is straight, you have better grip strength, and your hand will not fatigue as easily. Kneeling while working can cause awkward arm postures and put pressure on your knees. This work posture may cause pain and discomfort. Make your work easier by working in comfortable postures. Working overhead and reaching out with a tool for long periods of time may lead to lower back, arm, shoulder, and neck injuries. Choose tools that fit your hand comfortably. Whenever possible, use power tools or tools that require less force. Let your supervisor know if you need training on a new tool or process. Pick up debris and scrap material to prevent slips, trips, and falls. Keep pathways clear for carts, wheelbarrows, and dollies. Working overhead or in cramped spaces forces the body into awkward postures. To relieve muscle tension and improve circulation, change body positions, alternate tasks, and stretch throughout the day. When lifting a bucket, you will use less grip force if you increase the diameter of the handle by adding padding or by using a handle that has a bigger diameter. Breathe out and tighten your stomach as you lift. Use a 3-point lift when handling heavy material by yourself. By moving two limbs at the same time you only leave two points of contact on the step, rung, or ladder. This is an unstable platform from which to keep your balance or shift your weight. When climbing with only two points of contact if one point of contact slips, you will either be left hanging by one hand, or one foot or you will fall. By moving only one limb at a time you maintain a three point contact at all time (both feet and one hand, or both hands and one foot). This is a much safer, and a much more stable position. If one limb (or point of contact) slips while using a three point contact, you still have at least one hand and one foot on the structure to support your weight, and can recover without harm. You must ensure that your three points of contact have either a firm grip or solid purchase before moving the next hand or foot to another position. Note: When climbing using a three point method of climbing you cannot carry anything in your hands as it will not allow you to maintain three points contact at all times. Employees can slip or loose their balance while climbing by over-reaching while working from ladder. Use harness or suitable fall protection to work from a climbing structure. Slippery substances such as grease or oil on rungs or steps can also cause slips and falls. There is always the hazard of falling object from workers caring tools or materials up a a ladder. Do not hand carry objects while climbing. Use a sling, harness, or tool belt to carry tools or material, or line or hoist raise tools or material after climbing. Always inspect any ladder for damage or defect prior to use. Inspect for broken or missing rungs or steps, broken or split side rails, defective or missing safety pads, corrosion, securely fitting components between steps and side rails, rungs that are free of grease and oil, and no splinters or sharp points that may snag closing. Never stand on the four top rungs of a straight or extension ladder, or on the top two steps of a step ladder. Hoist tools and other material up after reaching the top of the ladder. Use of tool belts helps to manage tools while working from a ladder. Never over-reach while working from ladder. Work with your body within the ladder’s side rails. Descend and reposition ladder as needed to stay close to work. Rung or steps on metal ladders must be treated to prevent slipping. Treatment may include being corrugated, dimpled, knurled, or coated with non-skid, and slip-resistant material. Conclusion: If you consider how often you climb and descend, and up the steps you make these common means of access to higher or lower levels, you will probably find that you climb the equipment of a small mountain throughout the course of a day. Respect the hazard of climbing and take the time to do it safely. Ladders are involved in 29% of disabling falls among construction workers, which is the highest in the industry. To avoid becoming a statistic, learning to select the best ladder for the job is fundamental. Key factors to consider during ladder selection are type and style, length, duty rating, and the material from which the ladder is composed. Portable ladders are either self-supporting (standard stepladder), or non-self-supporting (extension ladder). Consider the type of work you are doing before deciding which style will work best. Consider the material that the ladder is made from, as well. Aluminum – Ladders made from aluminum are lightweight and resistant to corrosion; however, they do not insulate against heat or cold and conduct electricity. Never use this type of ladder around a charged electrical current. Fiberglass – this material makes ladders that are weather resistant, durable, and non-conductive when clean and dry; however, these ladders are very heavy and tend to chip and crack when handled improperly. Stepladders – when working from a stepladder, you should be able to reach about four feet from the top of the ladder, while standing on the second step from the top. Extension ladders – for the best setup, an extension ladder should be 7 – 10 feet longer than the vertical distance to the highest contact point on a structure. Attitudes have a great deal to do with how employees perform their daily tasks. Positive attitudes are conductive to safety performance and productivity, while negative attitudes can lead to accidents and injuries. Negative attitudes: Certain attitudes towards safety can put people at risk. Over-confidence: The belief that experience and skill can replace the need for safety precautions. Positive safety attitudes will spread throughout the work culture if each employee takes an active part in the discussion of how accidents can be prevented. About 1000 work-related eye injuries occur every day. Construction has the highest rate! Every day, more than 120 construction workers are disabled and forced to miss work because of an eye injury. Wearing protective glasses that cost as little as $7.50!! More importantly, those glasses will save your eyes. It only takes a second to injure your eye. But it takes a lot more time and money to heal. How do eye injures occur? At George Washington University Emergency Department, over 300 construction workers have been treated for eye injuries since 2010. Electricians, plumbers, and HVAC's tech's rank in the top five trades. What is getting into your eyes? Solvent splashes, liquids or gases under pressure, electrical sparks, nails, solder specks, grinding dust, glass, bits of wire, welding fumes. The when and how of eye injuries. Eye injuries can occur anytime anywhere on the job! If you: work overhead, weld, use power tools, work on live circuits, work with pressurized liquids or gas - you are especially at risk! Obviously, power tools create lots and lots of dust, not only for you, but for people around you. Power tools are especially hazardous in a confined space. Some injuries occur simply by passing a work area or working next to someone who is grinding, sawing or welding. Some workers we talked to were wearing eye protection when they were injured. Sometimes it was not the right kind and sometimes it was not the right fit! Safety glasses should have side shields and if possible upper and lower shields. Goggles are best! What to do if you get something in your eye? Rinse with clean water for at least 15 - 20 minutes. ANSI-approved eyewash stations are best. Eyewash bottles are not approved. But any clean water will do! Get medical attention! Ask the safety supervisor or first aid person to take a look at your eye. You might even need a trip to the ER. What about a cut or puncture? Don't wash or touch your eye or lift the upper lid of your eye! Workplace safety: Are you ready for your work day? Do you have your safety glasses? Are they handy? Do they fit properly? Do you know where the nearest eyewash stations are from your work area? Do you know how to get medical attention if needed? An eye injury is one of those things that are difficult to believe in – until it happens to you. It just doesn’t seem possible that a particle can fly through the air and strike your eye before you can blink. But that is precisely what can happen. 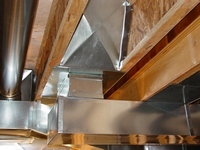 A sliver of wood, a chunk of metal or another object can be projected from a rotating machine or an impact tool. Your natural protective reflex is no match for the speed and force of the flying object. Unfortunately, many workers learn this lesson the hard way. They get an education in an instant, when something hits them in the eye. The resulting eye injury is likely to be painful and inconvenient and it can cause permanent blindness. Operate tools and equipment correctly according the manufacturer’s instructions and your safety training. Grinding equipment is a common cause of eye injury. Use the correct grinding wheel at the recommended speed, examining it first for any defects which might cause it to disintegrate. Use a vacuum system for cleanup rather than a broom or compressed air, both of which can send dust and larger particles into the air. Wear the safety eyewear recommended for your job. There are many different types of eye protection. Spectacles made of an impact resistant material are called for in many situations. Side shields add further effectiveness to safety glasses. Goggles are also used to protect against impact and particles. Other types of goggles provide protection from chemical liquids and vapors. A face shield may be required for operating with a high likelihood of producing flying debris. For a particle in the eye, lift the upper eyelid outward and pull it down over the lower lid. Let the tears wash out the particle or use eyewash. If the speck does not wash out, keep the eye closed and loosely bandaged while awaiting medical help. Don’t rub the eye. For a blow to the eye, gently apply a small cld compress without pressure to reduce discomfort and swelling. Seem emergency medical care in case of pain, reduced vision or a black eye, all of which can indicate imternal eye damage. For cuts or puncture of the eye or eyelid, bandage the eye lightly without pressure. Do not wash the eye with water and do not try to remove an object stuck in the eye. Get medical help right away. For a chemical splash, flood the eye with water from eyewash or another clean source for 15 to 20 minutes and medical help immediately. Don’t wait until you can’t see to believe in eye protection. Power tools can be very dangerous when used improperly. Cuts, punctures, electric shock and burns are common consequences of accidents involving these tools. Always exercise caution when working with or around power tools. Keep tools clean. Poor maintenance is responsible for many accidents. "Ouch! Why did I try to lift that much weight on my own? Did you ever ponder those words after you hoisted something heavy, or lifted from an awkward position? These incidents are well known causes of back strain, but you might not have considered other "underlying" factors that lead to back injury. Several conditions influence your "back health". The cause of most back problems is poor posture, loss of flexibility, stressful living/working habits and above all, a general decline in physical fitness. Surprised? You shouldn't be. When you "let yourself go", (and most of us do with age) the first thing to go can be back strength. Along with correct lifting techniques, we should also work on our overall physical condition. Nutrition is an important key to staying physically fit! As we grow older, our metabolism slows down. To counteract this natural event, we have to eat the right type of food and not too much of it or the pounds come on quickly! Now, what does nutrition have to do with a healthy back? For one thing, a healthy back is correctly balanced on your spine. With a "sway" back, that balance is lost and those darned potbellies cause sway backs. Carrying around excess weight puts tremendous strain on back tissues, so lifting even a small load cause an injury. Exercise plays an important role as well. A form of exercise as simple as walking 30 minutes a day can raise your heart rate and burn enough calories to help keep you lean. Flexibility is another condition that changes as we grow older, if we don't work to retain it. It's true, as they say - "Use it or lose it!" Without flexibility, we lose our body's full range of motion. Then, when a sudden physical demand takes a muscle or joint further than it's used to, thee risk of injury is high. You can do stretching exercises every morning to keep yourself flexible and ready for the physical demand on work. After all, don't athletes warm up before a game to prevent injury? Fixed positions - not moving enough - can also cause back problems. Staying in fixed position for too long can lead to muscle spasms. We feel it as stiffness, but by the time discomfort from "static" muscle contractions is experienced, low level tissue damage has begun. Take stretch breaks between long standing or sitting periods to improve circulation and prevent back strain. Emotional stress leads to mental distraction, so that thing other than proper body mechanics are on you mind. Stress and back pain seem to go together. Low back pain has been called "a tension headache that slipped". Solving our personal problems isn't always easy to do, but it often takes away back pain and helps prevent repeated injuries. In conclusion: Improper lifting isn't the only thing that causes back injuries. People who do not also stay in good physical and mental condition are at risk for back problems. It's up to you - take good care of your body and save your back! Make sure that your” surf board” is visible and can be distinguished from the insulation or attic flooring. Paint it a bright color (orange) so that you can easily see it in the dark work space. Make sure you have adequate lightning in the work area. Use lighted head gear or drop lights for additional visibility. We’ve all experienced it at some point when working or playing hard – fatigue sets in, your mouth feels dry and your legs are heavy and maybe you even get a headache. These are all common signs of dehydration. When you are working hard, body fluid is lost through sweat. If the fluid through sweat is not replaced, dehydration and early fatigue are unavoidable. Losing even 2% of body fluids (less than 3.5 pounds in 180-pound person) can impair performance by increasing fatigue and affecting cognitive kills. During the summer heat it’s easy to become dehydrated if you don’t drink enough fluids to replace what is lost in sweat. When to drink: Ensure you drink before you start working, trying to catch-up for fluids after a period of time is very difficult. Also, drink before you get thirsty. By the time you’re thirsty you are already dehydrated, so it’s important to drink at regular intervals – especially when it’s not outside. What to drink: Water is truly one of the best things to drink. Research also shows that a lightly flavored beverage with a small amount of sodium encourages people to drink enough to stay hydrated. The combination of flavor and electrolytes in a sport drink like Gatorade provides one of the best choices to help you stay properly hydrated. What not to drink: During activity, avoid drinks with high sugar content such as soda and even fruit juices. These are slow to absorb into the body. Also alcohol and caffeinated beverages should be avoided. Many people ask how much to drink and that truly depends on your activity level and how much your body is losing fluids. In general, when you are working and sweating, you should drink at least every half-hour. Ensure you are drinking enough to replace your lost fluids. A good rule of thumb from a wise man says: “if you aren’t urinating, you’re not drinking enough”. When you think of accidents involving motor vehicles, you probably thin of collisions. However, there is another leading type of injury accident – falls. Drivers, passengers and cargo handlers, among others, can be seriously injured in falls from vehicles and around vehicles. Maintain good lighting in work areas. Report any problems such as burned out fixtures. Falls around vehicles can cause serious injuries. Watch where your feet a going to prevent slips, trips and falls. Is driving after dark really that risky? The National Safety Council says it is. The organization claims: “Traffic death rates are three times grater at night than during the day.” To keep you safe on the road after sundown, we’ve put together a hit list of top tips for driving safely at night. Sure, that dirty wind shield seems annoying but harmless during the day – but it can cause blinding glare when sunlight and headlights hit it just right. Dust that you might not notice during the day can build up oh the inside, too, so it,s important to clean your windshield – both inside and out. Are your headlights and taillights in good working order& Are they aimed properly? What about your turn signals? You want to see and be seen without blinding other drivers, so make sure everything is aimed and working just right. And feel free to turn on your lights an hour before sundown; they may help other drivers see you coming. Try not to look directly into the lights of oncoming traffic. When cars are coming at you, do your best to cast your gaze down and to the right, while focusing on the white line. This will prevent you from being temporarily blinded by their headlights. Sure, you’re all in a rush to get home, but reducing your speed and avoiding tailgating is far likelier to get you there safe and sound. Use your headlights to help you gauge your distance and stopping time. If you can’t stop within the illuminated area you’re too close! Another way to gauge your distance is by using the 4 second rule: as the vehicle in front of you passes a designated landmark along the road(a tree, construction barrel, etc. ), there should be at least a 4-second gap before you reach the same area. If it takes less than 4 seconds to catch up, slow down! Increase following distance in poor weather. If you need to pull over, be sure you’re easily seen by other drivers. Carry reflective triangles, turn on your hazard lights, and even turn on your dome light to increase your chances of being seen. And remember: the safest place to wait for help I inside your car. Whether you’re texting, fiddling with the radio, or dining in your car, taking your attention off the road is dangerous. It’s not just the hefty fines that make distracted driving risky business. When you’re tired after a long day of work, your reaction times will be reduced. Taking your full attention off the road is a bad idea. Walkers and joggers don’t always wear safety gear, and can be incredibly difficult to see after dark. Always take extra time to watch for pedestrians, especially on poorly-lit roads. If you’re at an intersection, be sure to look both ways before you make your move to ensure no one is stepping off the curb. Safety shoes should be worn if there are hazards from falling objects or when handling heavy crates or equipment. Gloves and arm protectors should be used to prevent lacerations while handling sheet metal. Appropriate clothing should be worn to protect from heat or cold. Boots with good traction should be used if wading through pools of mud or water. It may be necessary to wear earplugs or muffs when noise levels surpass 90 decibels. Adequate respirators should be used whenever the air is contaminated with excessive concentrations of dust, fumes, mist, gases, or vapors. When working it it often necessary to bend, squat, crawl, or kneelfor extended periods. Any of these activities may cause injury to your knees. Knee injuries can be placed into two categories: impact injuries and strain & sprain injuries. Following are some steps to protect your knees and reduce the chance of knee injury. Soft padded cover that cushions knee. These kneepads will provide adequate protection for about term of occasional use. Hard plastic or leather outer layer over padded inner layer. These knee pads are better suited for extended and daily use; they will wear better and provide more protection to the knee. Knee pads should be used whenever your knees are susceptible to repetitive banging or grinding or when your job requires you to be on your knees for extended periods. While crawling on the floor or kneeling to perform a task it is possible that you will injure your knee by the pressure and impact of your kneecap bearing the weight of your body. Impact injuries can be very painful and may be permanent. Stretch your legs prior to beginning work. Stretch your legs frequently while squatting, bending or kneeling. Be aware of uneven walking surfaces that may increase the chance of twisting a knee, especially while carrying a load. Do not carry a load that is too heavy and may cause a serious back or knee injury. If you have weak or previously injured knees wear your knee pads brace while working on the job just as you would while playing sports. If you have previously experienced knee injuries, exercises to help strengthen the leg muscles. Do not lock your knees while performing routine tasks as this may increase the chance of hyper extending the knee joint. Use extra caution when using ladder and stairs. Conclusion: your knees are a vital and vulnerable part of your body. Injuries experienced may not be apparent, ofr may seem insignificant until later in your life. For these reasons it is extremely important that you protect and use preventative measures to keep your knees free of injuries and working properly for life. 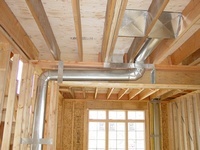 Thank you for your purchase of this chapter from the Ductwork Installation Guide! CONCLUSION – the chapter wishes a good luck in a new profession. Are you looking for work? Not yet? When you will, they are going to ask you about your experience and it should be at least from three to five years or even more then that! However, under a good supervision, it just one year is enough to put your hands on!! So, why do they need more, are they crazy? No, they are not! They just need that you able to do your job without asking too many questions!